The room was large and very clean. 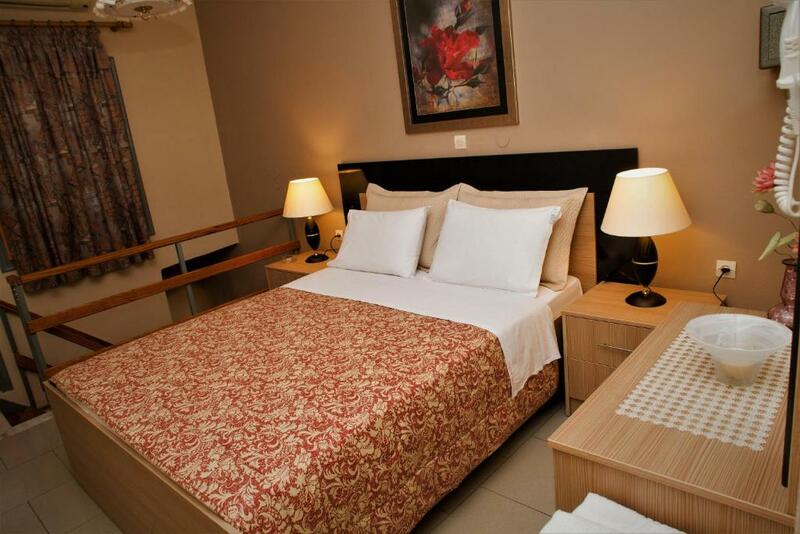 Location was very good, very close to shops, restaurants, bakery. The beach was in a minute walk. The host was very helpful, she helped with reservation and transfer. Ideal for family with kids. 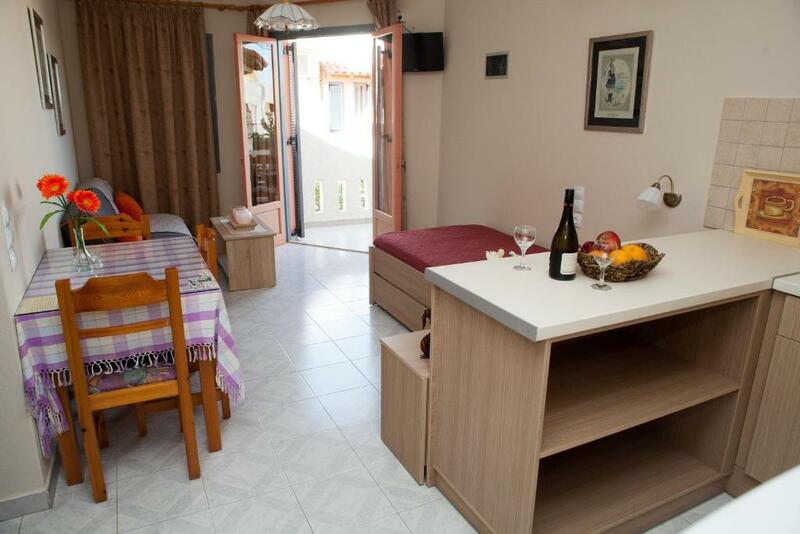 Palmira Apartments is conveniently located for beaches and dining places - mostly 5 minutes downhill walk. There are a couple of grocery stores, a bakery and a restaurant down the street. Rooms are spacious and regularly cleaned, the laundry room is well supplied. I will recommend this place and consider staying in it again if I revisit Makrigialos. The location was excellent. The apartment was very clean and spacious with a terrace and a balcony. I requested a seaview room and the request was met. The duplex apartment seemed like new, was impeccably cleaned every day, and was just a wonderful space to spend nine days. We arrived late at night and found our keys and a warm note of welcome. Refreshments in the fridge and good communication throughout the stay really makes us eager to return! Our welcome on arrival, Maria was there to greet us. The apartment was very well equipped especially the kitchen. The property was excellently maintained. On arrival were some basic food items and drinks which was a lovely touch. It was comfortable and clean with enough kitchenware to use . Maria went out of her way to source a high chair when all her others were in use. The furniture was great and made it very comfortable. 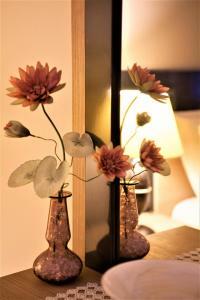 The property was cleaned brilliantly on a daily basis. Whilst we tried to keep things tidy, with a 4 year old and a 7 month old, it was lovely to have the beds made every day and clean bathroom and kitchen. I am certain they did over and above what was required. Good AC, parking, great beaches within walking distance. These have been the best equipped, well presented and highest maintained apartments that we have stayed at in Greece in recent years. The location is fantastic, with the port/bar/tavern area less than a minutes stroll away. Maria, family and the team are lovely people, very friendly and always on hand for advice and a chat. The communications with Maria were excellent and a couple of requests were readily and kindly met. Great base for walking the Kapsis, Pefiki and Butterfly gorges al of which are superb if you like quite strenuous walking. Will return to both Makry-Gialos and the Palmira apartments. Lock in a great price for Palmira Apartments – rated 9.5 by recent guests! One of our best sellers in Makry Gialos! Just a short walk away from the sandy beach of Makrys Gialos, Palmira Apartments offers self-catering accommodations with a furnished sea-view balcony set around a flowery courtyard with tables and benches. 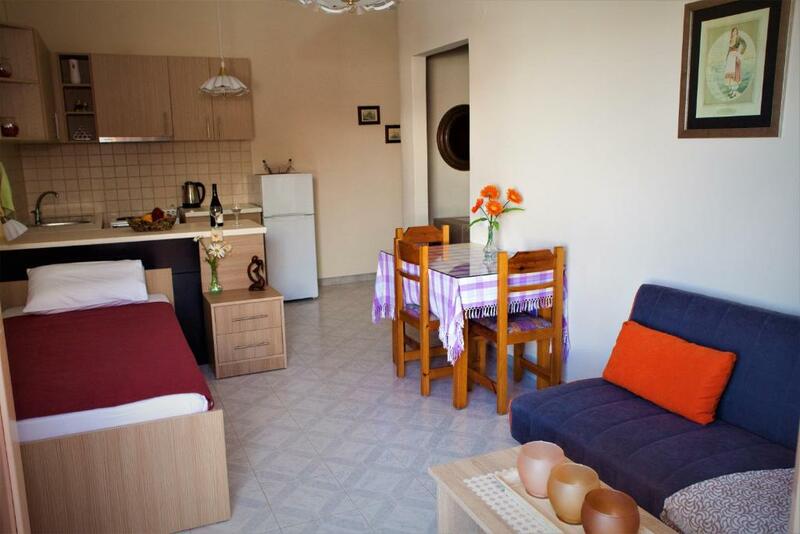 The air-conditioned apartments at Palmira are spacious, each with a separate bedroom. They all include a kitchenette equipped with electric kettle and mini fridge, as well as 2 TV sets. In the center of Makrys Gialos, guests will find seaside taverns, bars and cafes. The town of Sitia is 22 mi away, while Ierapetra is at 18 mi. Free parking is available on site. 뀐 Located in the top-rated area in Makry Gialos, this property has an excellent location score of 9.2! When would you like to stay at Palmira Apartments? Featuring a sea-view balcony, this air-conditioned apartment includes a separate bedroom, kitchenette and two TV sets, one in every room. 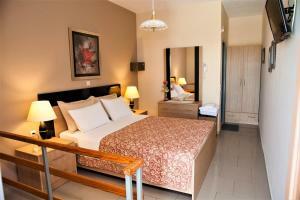 Featuring a sea-view balcony, this air-conditioned apartment includes a separate bedroom, kitchenette and two TV sets. This apartment has a stovetop, electric kettle, 2 TV sets and a seating area. This apartment features a kitchenware, electric kettle and two TV sets. 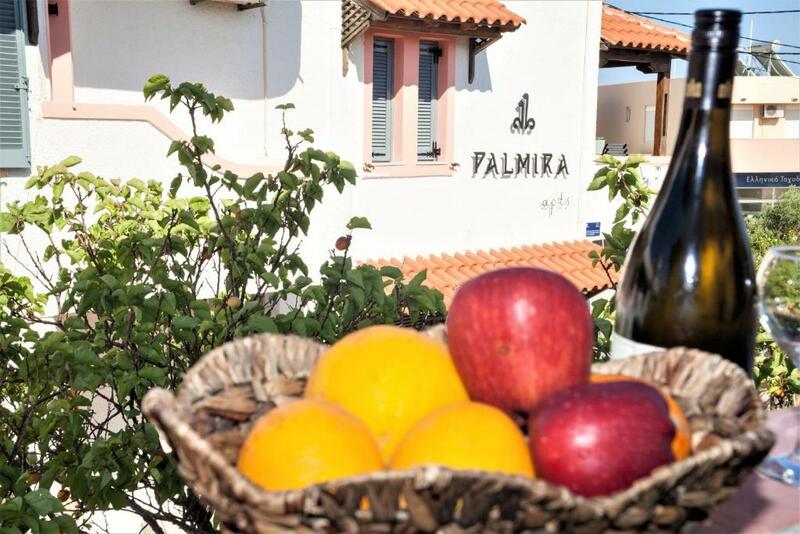 Palmira Apartments is a first class complex situated on the main village road of Makrigialos and is just 5 minutes downhill walk of the traditional harbor and the main sandy beach where there are plenty of restaurants, cafes and shops. 'PALMIRA apartments' consists of 8 single-level apartments, on either first or ground floor and 8 slit-level apartments /Maisonettes, where the first floor is connected to the second by an internal stair. 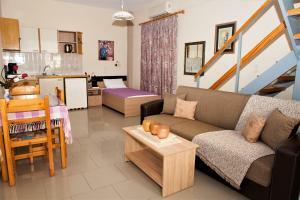 Each air-conditioned apartment is about 51 sqm and can accommodate up to 4 or 5 persons. Also they are fully equipped in order to provide comfort. Our guests can enjoy the breathtaking view of the sea or the flowery courtyard from the balconies and terraces! Palmira apartments is located in the real heart of Makrigialos village. As a result, it is next to a supermarket, a bakery, a grocery store, a post office, medical centers and near banks, gas stations and water sport centers and day trip centers - for example towards Gaidouronisi island with the Roman theater and with the sandy beach and crystal clear waters. As for the food and nightlife lovers, traditional taverns, cafés and bars are just 5 minutes downhill walk from our accommodation. Apart from the view of Makrigialos bay, visitors have also the opportunity to admire the magnificent view of the mountain with the pine forest, which is ideal for hikers and trekkers. The beautiful villages which are situated a few kilometers away, offer a chance to familiarize with Cretan tradition. House Rules Palmira Apartments takes special requests – add in the next step! Palmira Apartments accepts these cards and reserves the right to temporarily hold an amount prior to arrival. Please inform Palmira Apartments of your expected arrival time in advance. You can use the Special Requests box when booking, or contact the property directly using the contact details in your confirmation. Maria, the owner, visited us day after our arrival and alerted us that she will not always be around, and that was rather difficult. I would have been nice if someone who understood English was around to provide information. Our credit cards, issued in the US and the Philippines, were declared unacceptable and we had to pay cash (unexpected). We contacted the bank and were told there was no problem; we used the same card extensively during the rest of our 4 week vacation in Crete, Germany and Austria. There was a little noise from the street but we still wanted the apartment closest to the street because of the sea view. There is nothing that we didn't like. We had a wonderful stay. 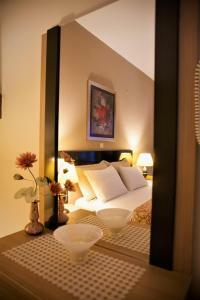 Bed suitable only for people accustomed creten/grece style beds (hard, was possible to soften somewhat with blankets). Few activity possibilities around besides beach activities. The bed very comfortable.The property was immaculate with beautiful gardens.Water wine and juice in the fridge on arrival was very welcome. Well organized small hospitality structure, with a dozen or so of apartments. The one I used was very well equipped, quite new and perfectly clean. The position is convenient for the beaches of Makry Gialos and surrounded by good restaurants, if you do not want working in your own kitchen. Nice and courteous proprietary. Standard of cleanliness very good, very comfy bed, great location and lovely hosts.